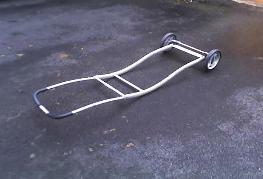 one the trailer and PVC pipe. beginning to think that we might actually have something that will work. 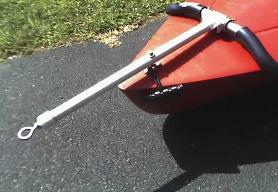 With the kayak resting securely in the PVC bed, the next step was how to attach it to the rear of the bike. 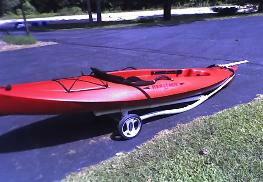 weight and overall the trailer and kayak weighs about 60 lbs. wider tire track than the bike, and then you learn not lean the bike over very far, not all that difficult. 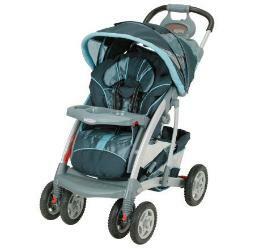 Total cost of this project was about $20.00 for piping and hardware, baby stroller was free.